When your staff member creates an appointment on their Office 365 work calendar, it will block their availability in Bookings. And when a booking is made by a customer using the Bookings online app, that booking shows up on their work calendar. Bookings won’t show any personal information in the Bookings calendar. It will only show that the time isn’t available for appointments. Note: Bookings is turned on by default for customers who have the Office 365 Business Premium, or Office 365 Education A3 and A5 subscriptions. 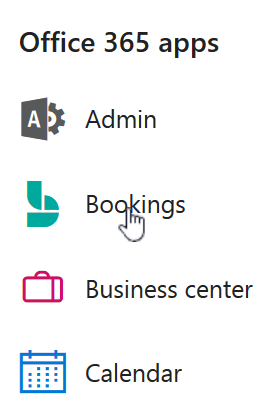 Bookings is also available to customers who have Office 365 Enterprise E3 and E5, but it is turned off by default. To turn it on, see Get access to the Office 365 business apps for enterprise subscriptions. Having problems syncing your staff’s calendars? Check out Troubleshoot: This staff member’s calendar can’t be synced for solutions. To sync a user’s personal Office 365 work calendar with Bookings, you’ll need to turn this on for each staff member from the Staff page in Bookings. You also have to be the Bookings calendar admin to make this change. Note: You can only sync calendars for users who have an Office 365 work account within your Office 365 organization. You can’t use an external calendar, such as Outlook.com. Bookings provides your business a unique web page that your customers can use to schedule appointments, even when you’re not around to pick up the phone or respond to an email. The web page is simple to use: the customer first selects the service they want and, based on availability you provide, chooses a day and time when you or one of your staff is available, enters their contact information and books the appointment. The web page looks great on both larger screens and mobile devices. It’s easy to link to your scheduling page from an email that you send to customers or from your business’s website or Facebook page. Customers can book with your business from any device. Your customers can easily reschedule or cancel the booking. All customer bookings are visible in a centralized booking calendar, giving you a complete view of upcoming appointments. You can reschedule, cancel or re-assign an existing booking to another available staff member. You can also quickly create a new booking if you’re talking with a customer in-person or on the phone and use the day “split view” to quickly see which staff is available at a given time. Bookings provides a clear view of your staff’s daily schedule on the web and mobile. Bookings also provides you with a customer list to help stay in touch with your customers. Each time a customer creates a booking using your scheduling page (or you create one for them in your booking calendar), Bookings automatically creates a contact for them in your Customers list inside Bookings. You can manage all of these capabilities on the web, with easy access from the Office 365 navigation bar. For those times when you’re out of the office, in the coming months Bookings will have a mobile app that lets you manage your bookings or contact your customers with a few taps. Get appointment details and customer information in the Bookings app. You work hard to build your business, and as your company expands, Bookings grows with you. You can create different booking pages and easily add new staff members as your workforce grows. 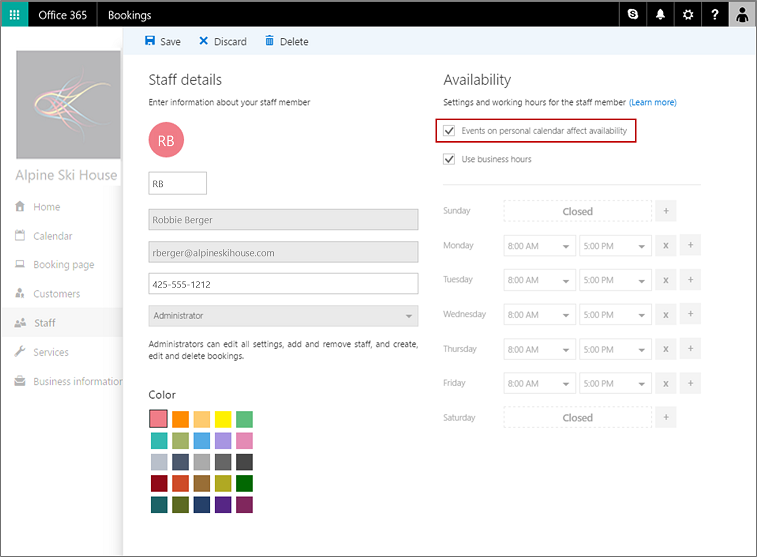 There is no additional cost for creating multiple booking pages, and additional staff members aren’t required to have Office 365 subscriptions. Bookings is now rolling out in First Release to customers who subscribe to the Office 365 Business Premium plan and will roll out to all Business Premium customers worldwide in the coming months. Once it rolls out, anyone with an Office 365 Business Premium subscription can access Bookings in the app launcher within the Office 365 web experience. Bookings doesn’t require your business email to be routed through Office 365, so you can keep using your current business email service with no changes. To get started, sign in to Office 365, open Bookings from the app launcher and then click the Get it now button. You’ll need to provide a bit of information about your business and the services you want your customers to book. After that, just click the Save and publish button in the booking page tab to publish your scheduling web page. Your customers will now be able to start booking appointments with your business. It’s that easy! We hope Bookings will free up time for you to grow your business, help you reduce missed appointments and no-shows and keep you on top of your business wherever you are. As you use Bookings, please tell us what you think by providing feedback in the Bookings home page. K. Hogyan menedzselem az időpontjaimat, amikor nem vagyok az irodában? w do I manage the appointments while I am away from the office? V. Az időpont foglaló rendszer rendelkezik mobil telefonra telepíthető applikációval, így az arra jogosult felhasználók bármikor bárhonnan menedzselhetik és láthatják a lefoglalt időpontokat, illetve az azokhoz tartozó ügyfél információkat. K. Az ügyfeleim látni fogják a személyes vagy céges naptáramat? V. Nem. Ügyfelei csak azokat az időpont foglaló naptárakat fogják látni, amiket Ön online közzétesz. Ön állíthatja be a foglalható szolgáltatásokat, időpontokat és opcionálisan azt, hogy mely kollégák végzik a szolgáltatásokat, és az időpont foglaló naptárban mindösze ezek látszanak. K. Az ügyfeleimnek le kell tölteniük valamilyen applikációt, hogy időpontot foglalhassanak? V. Nem. Ügyfelei hozzáférhetnek az Ön web-alapú foglalási oldalához akár egy mobil, tablet, laptop, vagy asztali számítógép használatával egy böngészőn keresztül. Bookings gives you a fast, easy alternative to time-consuming, frustrating phone-scheduling. An easy-to-set-up, customizable webpage lets your customers find available times and book appointments 24/7. You get a private calendar for managing your schedule and automatic confirmations and reminders that save time. Easily publish and manage your business information across top websites. Attract and retain customers with simple-to-use email marketing. Learn how to manage business apps centrally from the Office 365 Business center. Microsoft Bookings and the new business apps are part of Office 365 Business Premium. Stay productive with always up-to-date Office apps, email, file storage, sharing, and more.